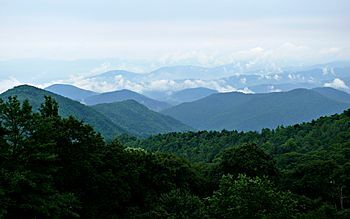 The Blue Ridge Mountains are mountains that go across the eastern United States. They go through Georgia, North Carolina, Tennessee, Virginia, Maryland, Pennsylvania, South Carolina, and West Virginia. Its highest point is Mount Mitchell in North Carolina. The first mountain or best known mountain, is Blue Mountain in Pennsylvania. The Blue Ridge Mountains as seen from Blowing Rock, North Carolina. Blue Ridge Mountains Facts for Kids. Kiddle Encyclopedia.